12 Comment(s) BraveChampion48 Avatar Embargo I didn't change my avatar for 90 days Website Minecraft Is Awesome! I love Minecraft! Express Yourself Video Games I like to play video games! Hobbies 5 months ago Oh... 😥 IAmRalsei Forum Leader Hidden Achievements First Year My account is over 1 year old Website Expert Programmer Programming no longer gives me any trouble. Come to me for help, if you like! Programming Strength 5 months ago Well, the full game can use a compression program to dodge SmileBoom's copyright detectors. BraveChampion48 Avatar Embargo I didn't change my avatar for 90 days Website Minecraft Is Awesome! I love Minecraft! Express Yourself Video Games I like to play video games! Hobbies 5 months ago Cool! Have you seen gameplay to Bomberman? IAmRalsei Forum Leader Hidden Achievements First Year My account is over 1 year old Website Expert Programmer Programming no longer gives me any trouble. Come to me for help, if you like! Programming Strength 5 months ago I think so, but i can't remember if I've ever played it. 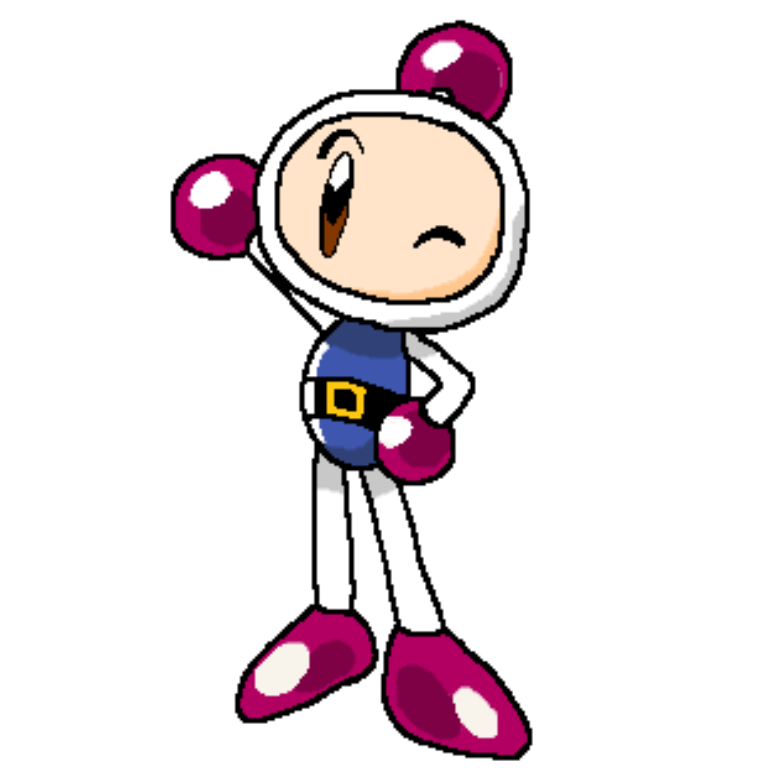 I'll try to get Bomberman R on my switch to make the project more accurate to official Bomberman games. BraveChampion48 Avatar Embargo I didn't change my avatar for 90 days Website Minecraft Is Awesome! I love Minecraft! Express Yourself Video Games I like to play video games! Hobbies 4 months ago How did Super Bomberman R go so far? IAmRalsei Forum Leader Hidden Achievements First Year My account is over 1 year old Website Expert Programmer Programming no longer gives me any trouble. Come to me for help, if you like! Programming Strength 4 months ago Super Bomberman R??? BraveChampion48 Avatar Embargo I didn't change my avatar for 90 days Website Minecraft Is Awesome! I love Minecraft! Express Yourself Video Games I like to play video games! Hobbies 4 months ago Yup! That's the Switch game that you're planning to get! ;) I have this on my Switch. IAmRalsei Forum Leader Hidden Achievements First Year My account is over 1 year old Website Expert Programmer Programming no longer gives me any trouble. Come to me for help, if you like! Programming Strength Edited 4 months ago i forgot about the super at the start of the name lol BraveChampion48 Avatar Embargo I didn't change my avatar for 90 days Website Minecraft Is Awesome! I love Minecraft! Express Yourself Video Games I like to play video games! Hobbies Edited 4 months ago I know the controls for Super Bomberman R. I looked at the controls from the Switch case to this. L Stick: Move A: Set a bomb / Pick up and throw a bomb / Confirm B: Special Ability X: Stop a bomb after you kicked it Y: Bomb Punch (if the "Punch" power up, which looks like a boxing glove, is picked up) Up, Down, Left, Right: Up, Down, Left, Right L, R, ZL, and ZR are unused. IAmRalsei Forum Leader Hidden Achievements First Year My account is over 1 year old Website Expert Programmer Programming no longer gives me any trouble. Come to me for help, if you like! Programming Strength 4 months ago Okay. HTV04 Intermediate Programmer I can make programs, but I still have trouble here and there. Programming Strength Avatar Taboo I didn't change my avatar for 180 days Website Second Year My account is over 2 years old Website Edited 5 months ago SmileBoom may remove this, as it seems that what you've uploaded has copyrighted material. BraveChampion48 Avatar Embargo I didn't change my avatar for 90 days Website Minecraft Is Awesome! I love Minecraft! Express Yourself Video Games I like to play video games! Hobbies 5 months ago Don't forget! Load this project when you program for this project. On the SMILE Tool, select the Paint tool, then select "Load". Type in "BOMBERMAN", then select "Yes." You'll then be led to the Sprites that I tried.